There are 3 places you want to be in people’s busy lives if you want to get your message across over and over. One is in their car, the second is on their refrigerator and the third is by their computer. Why those places? Most people spend the most time each day in their cars, near their refrigerator or at their computer. How do you get your message to people at each of those? Think of what you personally do in a car. You might play a CD, adjust your mirror(s), apply makeup or check for stray hairs before a meeting. 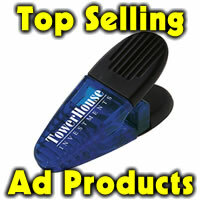 A visor CD holder can have your logo or message imprinted so that they see your message as they reach for a CD. Air fresheners that hang from the rear view mirror can be imprinted. The long valued litter bag can have your message imprinted. There’s the gel mat that sticks to the dash board to hold sunglasses or cell phone from sliding all over the dash. Sun shades for the front windshield provide a huge imprint area. For their refrigerator, how about a calendar sports magnet or magnet frame? For pennies your name or logo will stick around for a long time. Anyone who delivers anything to a home or office (flowers, pizza, other takeout food, etc.) as well a service individuals where people want the information instantly at a glance, plumbers, auto repair, lawncare-would benefit from magnets. Custom shapes are available as are business card magnets. 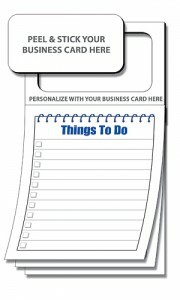 Shopping list magnets or wipe off boards are other useful items for household services. The best convertible baby car seats will be the next thing for car lovers. Third, the computer or desk. Adhesive notepads notes come to mind first. Your name or message for pennies. 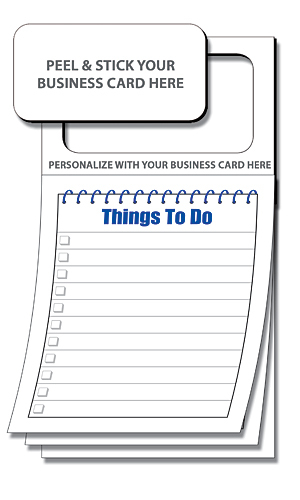 Pick a size, pick a background color and voila, every time someone sends a note to a teacher, the milkman, a sales person, or anyone, and there your name and information. Mousepads, calculators, monitor calendars, you name it, if it’s sticking around someone’s computer or desk, your name will come to their mind because they see it again and again. For other ideas or to check availability contact cheryl@thankem.com We are always thinking outside the box for you!